While it is most definitely true that some people that ride motorcycles from “The Motorcycle Company” are cool, it’s not because they own Harleys. They are cool AND they chose to ride Harleys. But there are people that are cool and they choose to ride Vespas. The issue here is the great number of people that buy Harleys and other “lifestyle” motorcycles because it will make them cool. This is “checkbook cool”. No work needed, just add money and you’re cool. To whom? Well, definitely to other people that did the same thing and wrote a check. After all, one chink in the armor there, and the whole house of cards could come crashing down! If, all of a sudden, object that everyone was spending all their money on to be cool all of a sudden isn’t cool anymore, then the now familiar “bubble” in that particular “market for cool” would burst, and you’d have a lot of equipment and associated bits flooding the market, and everyone would be trying to get something else that is cool. A classic example of this is the Ferrari market just after Enzo died. It went through the ceiling, then burst as speculators paying exorbitant prices couldn’t find anyone to purchase, and dumping began that, nearly 20 years later, only has about 50-75% of the values at that point. I’m not saying that the Harley market is going to crash. I’m also not insinuating that people will stop buying cruisers. My point is, buy something based on facts, what YOU want, and consider all options. Too often, I’ll be talking to people that want to get a cruiser, perhaps their first one, and they are fixated on the Harley, and ONLY the Harley. Sometimes you’ll have the Yamaha, Suzuki, Victory or others in the mix, but I don’t hear anyone saying, “What about that big Guzzi“, or “I considered the Guzzi but want the Roadliner“, etc. The California Vintage isn’t on their radar. Why? Lack of logo underwear? No lifestyle? What! The Guzzi is a great bagger for the serious rider. –you’d be lucky to get under $20-22,000. You want a great commuter cruiser. Oh, and you aren’t buying a hangar queen. You’re hittin’ the road! You should consider the Guzzi. You should ride the California Vintage and see if it’s for you. Find out when the dealer is going to have rides available and get on the bike. Fill up the bags. Bring the white helmet and sunglasses, and you’re CHP – 1972. Retro with some serious riding chops, that’s the California Vintage. The California Vintage leaps into the modern world from 1972 like Bob Beaman’s long jump. It may not be your bike, but it’s worth your consideration. You’ll be pleasantly surprised. I’m going to go out on a limb here and recommend the California Vintage if you’ve never had a bagger before. Reason for this is that it’s light. Some of the really big bikes are incredibly difficult to get in and out of parking spaces, let alone get around parking lots. They are not easy to get the hang of, and can be downright dangerous to someone that doesn’t have a lot of experience, or doesn’t ride much. The Guzzi is well-suited because it’s conservative geometry and low center of gravity allow a less-experienced rider to easily get around a parking lot, and build serious confidence on the open road. Sweepers and bumpy turns become no big deal in no time, and the linked brakes and featherweight controls allow the rider to stop on a piece of newspaper. It’s a very easy bike to ride, but if you ride a lot, it’s very rewarding as you’ll just be able to DUST some of the big cruisers through the twisties. They may pass you as they blow by at 130mph, but if you’re like me, that just doesn’t matter, as I don’t ride much with anyone that is trying to die or attract too much attention from John Q. Law. The Cal is your friendly neighborhood happy speed bike that is the cruiser that sport bike and sport-touring types should buy. It’s the cruiser for the rider that is going to reel in some big miles next year. 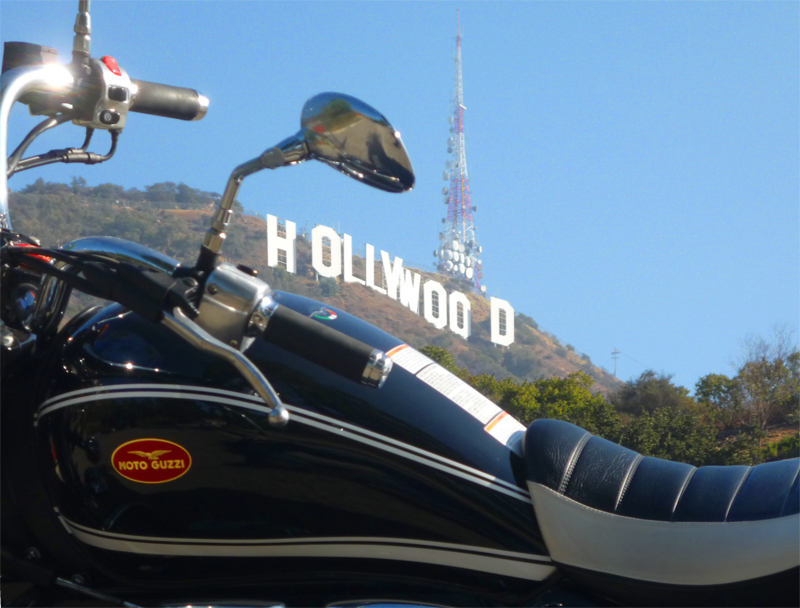 Next post — Comparing the California Vintage with the Harley-Davidson Heritage Softail. This entry was posted in bike reviews, Choosing a motorcycle, Motorcycles and tagged bagger, bagger battle, beginner cruiser, cool cruiser, european bagger, first cruiser, first motorcycle, guzzi bagger, italian bike, new motorcycle. Bookmark the permalink. deal breaker. I will own a Cal Vin one day. I’ve been following your posts and read each and every one of them. Interesting stuff and I’m glad you are taking the time to do this. Many? most? all? of the Guzzi people I’ve met seem to be those who aren’t much into the latest fads, trends, or popular culture. Instead, we largely march to our own drummer. This doesn’t make us better or worse people, but it certainly makes it difficult for anyone to sell us anything, much less a new motorcycle. If Guzzi is going to “survive”, they have to market to people other than most existing Guzzi owners. Certainly Moto Guzzi needs to take care of existing owners, but I don’t think existing owners need to be marketed to, as we are already “in the know”. This statement may offend some, but I think it is true. Greg Bender is not the market for new Guzzis. I’ve never bought a new Guzzi. Don’t ever plan to; and Guzzi is right *not* to market to me. This is not to say I don’t ever plan to purchase a newer Guzzi. On the contrary, I very much enjoy my 2000 Quota and I can certainly see myself purchasing a used 1200 Sport, etc. someday down the line (just call me a guy who indirectly helps new motorcycle purchases by directly contributing to the used motorcycle market). I’ve been “offended” in the past when Dealer X, Y, or Z has commented to me and those around me that we need to get rid of our old Guzzis and buy new ones (and yes, I’ve been told precisely that by more than one Guzzi dealer when they’ve learned that I ride a 1971 Ambassador). Their breathe is wasted on me because I don’t intend to ever get rid of my old Guzzi. But, their sentiment is only too true…dealers sell new bikes to people who buy new bikes, not to people who ride 40 year old machines and who plan to ride them for another 40 years. Guzzi needs buyers with new blood in the United States. They have relied on existing blood for decades here and that tactic has proved futile. Can Guzzi become a brand that is recognized and desired by the pop culture masses? I suppose it is possible. Harley Davidson has done it, BMW too, and to a lesser extent Ducati. Guzzi doesn’t need to change their engineering to make this happen. Rather, they’d need to pour millions into marketing and advertisement. I don’t see this as likely to happen. And it doesn’t need to happen, either. Danilo, you pointed out to me that there are a lot more “interesting people” out there than there are “interesting people who ride Moto Guzzis.” You’re right. If Moto Guzzi can target its marketing to that segment, then I think they’ll sell more motorcycles. How do you target that market? I haven’t the foggiest clue. I am, of course, quite biased in my views. I love my Moto Guzzis. I very much enjoy riding them all across the country, and I derive a great sense of pleasure from restoring older ones. I like the interesting Guzzi people I’ve met. They are the reason why I routinely stay involved with local Guzzisti and keep going back to rallies each year. I don’t know if my ramblings are helpful or not (I suspect not). But I do hope there is something in there somewhere that’ll prove useful. At the end of it all, I very much desire for Moto Guzzi to remain in business and sell many more motorcycles each year.